Everybody must have heard the saying, “Practice makes a man perfect”. The more GRE practice test taken by the students before the actual test, the higher they scored on test day. A huge number of students do not take more than one practice tests and this results in a lower overall score on the actual test day as they are simply not ready to take the test. Now the questions arise that how do you practice better? Where can you look for the resources and practice test for the GRE? There are so many firms out there in the market offering GRE practice tests to the test takers. You have both paid and free versions available for you. But then again, having too many options is not too good. So, here in this article, we have compiled a list of some of the best and free GRE Practice tests which you must take before the actual test. You probably need not take all the listed tests. You can choose from the list whichever test you want. Go for the tests which you think are important to you. But if you have a lot of free time, you can take all of them, if possible. However, if you need a quick practice test or two, choose whatever you think will work for you. In case you need more information about any particular test, you can go to their respective website to find out more. 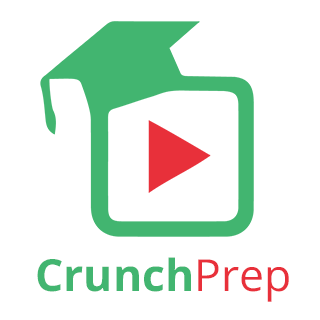 The CrunchPrep GRE Test is full-length tests offered by CrunchPrep are very close to the GRE, and almost look like the real test. This practice test is a must have as a pre-study test or a diagnostic test as the questions on the test are pretty much up in terms of quality and at the end of the practice test, you will receive a very comprehensive analysis of your performance. The comprehensive analysis comprises of the crucial statistics like skill data, performance review and the analysis of each and every question, which will help you get a detailed statistics on your accuracy, time management, your weak as well as strong areas and you will also get an accurate score prediction as well. This type of analysis will aid your GRE prep, especially when you are planning to take a diagnostic test and prepare a study plan based on its results. Also, your AWA responses on the test will be scored for free of cost and you will be given a comprehensive idea of your test performance. Undoubtedly, this is a must take a test to get an idea of the real GRE test. The PowerPrep by ETS (the makers of GRE) offers 2 free GRE practice tests to the test takers. Since the practice tests are offered by the creators themselves, it is the far by the best source of practice you can get for the GRE. The questions asked in the test are the ones which have previously appeared on real GRE tests, so you can exactly know what kind of questions to expect on test day. This will also give the test takers an idea about how difficult the real deal is going to be. Another plus point of this test is its user interface which is exactly the same as the real test. So if you go for this practice test by the PowerPrep, things will be easy for you on test day. You need not have to sweat the tiny stuff such as the tutorial section, or how to answer and leave out a question, etc. Also, your actual GRE score won’t differ much from what you get on the PowerPrep; it is that accurate. The GRE practice tests offered by ManhattanPrep are extremely good, and very famous among GRE test takers. It is commonly taken as a diagnostic test as the quality of test questions is way far better. Also, they give you an analysis of your performance at the end of the test. Though the test analysis offered is not as thorough as with the CrunchPrep test, but it still helps you in understanding where you stand, in terms of your score. Also, the user interface is pretty decent even for the first timers, which makes it smoother to take the test. The GRE practice test offered by the Kaplan is somewhat similar to the one offered by the Manhattan Prep, but it is seen as one of the toughest tests you will come across during your GRE preparation. The questions asked on the test are slightly tougher than the ones you will see on the real GRE. Therefore, your score in this test will be slightly lesser than normal but you need not worry about it. Getting yourself familiar to the tough problems will only make you better and will help you on the actual test day. Again, the GRE practice test offered by the Princeton Review is kind of similar to the Manhattan Prep test; however the former offers comparatively easier questions than the latter. The quality of the questions asked is good and you may see a higher overall score, as the questions are relatively easier than, say, the Kaplan or the Manhattan practice tests. Therefore your score tends to be slightly higher than usual and so you must not take them for granted. On an all, you can see the Princeton Review test as a great source of practice for the GRE exam. Giving this test will help you come across your strengths and weaknesses so that you can rectify your mistakes prior to the main GRE exam. Using the test scores, you can easily judge your preparation so far and make your preparation strategy for the future accordingly. You can take this GRE practice test on your mobile device, or tablet or your computer. To add to this, they offer a pretty decent user interface to the test takers so that they do not face any kind of difficulty while attempting the practice test. The McGraw – Hill GRE practice test is another great source to prepare for your GRE exam. However, they offer only one free test per user on their official website. The GRE practice test offered by the McGraw – Hill is again similar to its Princeton Review counterpart, but you can consider the scores of this test to be almost real. You will not find much difference in the overall score of the GRE practice test offered by the McGraw – Hill and the actual GRE test, except for a few points in each section, if not more. To add to this, there are explanations given for each and every questions asked on the test, so that you can compare your answers after the test is over. This will help you identify the common mistakes committed by you during the test so that they can be avoided on the actual test day. The GRE practice test offered by the Peterson’s is a really useful resource for your GRE preparation. They offer 3 free full-length practice tests to the students preparing for the GRE exam. At the end of the test, they provide you a detailed explanation to each and every question. This will help you analyze your result so that you can use them to strategize and develop a plan accordingly. You can easily identify your strengths and weakness in order to develop your strategy for the real exam. You can take this GRE practice test on your mobile device, or tablet or your computer. The GRE Practice tests offered by the 4Tests.com have a good quality of questions for the test takers. You can go for this test if you have ample of time left for the actual GRE exam and you need to analyze how you have been doing so far. The TestDen GRE practice test is another online GRE practice test for the students preparing for GRE. Again, you can go for this test if you have ample of time left for the actual GRE exam and you need to analyze how you have been doing so far. They also have various gifts for the test takers. For instance, get a high score and win an iPod. The TestDEN’s online GRE practice test takes 18 minutes to complete. You can use this test to see what else you need to prepare for your actual GRE exam and also judge your preparation so far. The GRE practice test by freegretest.net will have questions of varying difficulty and as of now, not in any particular order. It is basically a combo of the Verbal practice test & the Math practice test. You can submit the question for evaluation once an answer is chosen in the GRE practice test by clicking on the radio button corresponding to the answer. The next page will indicate whether the given answer was right or not. They also provide an explanation for each and every GRE practice question asked in the practice test. You can use this test to see what else you need to prepare for your actual GRE exam and also judge your preparation so far. Giving this test will help you come across your strengths and weaknesses so that you can rectify your mistakes prior to the main GRE exam. Using the test scores, you can easily judge your preparation so far and make your preparation strategy for the future accordingly. You can take this GRE practice test on your mobile device, or tablet or your computer. The GRE practice test offered by Majortests helps the test takers prepare for the GRE in an efficient way. There is no need to register in order to give this free test. They practice test questions are developed by the test prep professionals and reflect any new changes included. They arrange 100s of practice questions in mini tests, and each mini test comes with a scorecard at the end. Also, they offer explanations to the questions you get wrong in order to help you learn from your mistakes. In the verbal section, they provide over 20 practice tests covering topics like sentence equivalence, text completion and reading comprehension. 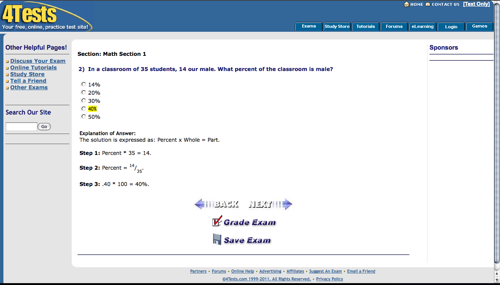 And under the quantitative section, they offer 30 practice tests covering questions on problem-solving, numeric entry and quantitative comparisons. You can use this test as a measure to analyze your practice so far and plan up your strategy for the future. This is another great measure to prepare for your GRE exam. The free GRE practice by the Union Test Prep will help the test takers to prepare for the various types of questions you will come across on the actual test day, so you can take the actual test feeling more prepared and confident. Don’t get disheartened by a low score on the GRE and plan your strategy based on the scores of the test. They cover questions from all the sections, namely, analytical writing, quantitative reasoning and verbal reasoning. You can use this test to see what else you need to prepare for your actual GRE exam and also judge your preparation so far. Giving this test will help you come across your strengths and weaknesses so that you can rectify your mistakes prior to the main GRE exam. t will help you analyze your strengths and weaknesses; you can wisely concentrate on the areas that need the most work. This practice test will give an exposure to weak areas that need further study. It covers all the subjects included on the GRE: Analytical Writing, Quantitative Reasoning (math), and Verbal Reasoning. You majority of study time will need to be focused on the questions that you missed and had no idea of which answer was correct. No need to stress over these questions. 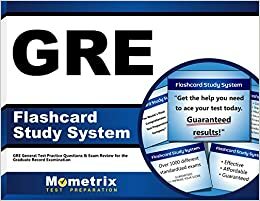 Mometrix offers you all you need for your preparation and score well on the actual GRE test day. You can visit their official site in order to take the free tests and also make use of their comprehensive study material for your GRE preparation. Byju’s is a name heard by one and all. The mock test offered by the Byju’s is a great way to prepare for your GRE preparation. Analyze your GRE preparation by taking up the mock GRE test provided by the Byju’s. They have a huge number of quality questions specially prepared by the test professionals in order to provide you with a real like feel. They offer an explanation about each and every question at the end of the test so that you know what went wrong and work on the weaker areas. It covers all the subjects included on the GRE: Analytical Writing, Quantitative Reasoning (math), and Verbal Reasoning. You can take up this mock test by the Byju’s sitting at your home so that your precious time is not wasted. Also, their report at the end of the test will help you see your performance in the test. Taking up a GRE mock test will not only tell you what to expect from the test in terms of form and content, but it also ends up being a huge time-saver on test day. You can sign up for the Magoosh GRE in order to avail their full-length practice tests for the GRE exam. Not only this, they also provide you with resources to help you prepare for exactly you need. After signing up for the Magoosh, you can choose to take a full practice test or start a shorter, customizable practice session. Also, you can review your results by clicking on ‘Review’ and then filter your results using a variety of criteria, or scroll down to view a summary of your past practice sessions. You can maximize your GRE score using the expert lesson videos and practice questions offered by Barron’s test prep. The Barron’s offers detailed and step by step approach to the actual practice test problems from the exam. It also gives you personalized report so that you can analyze your performance so far and work upon your study plan accordingly. Their online GRE practice tests have ample of practice material for the revised GRE exam. They provide you with access to hundreds of quizzes for practice, 4 full-length mock tests and also 1 diagnostic test as per the latest format of the new GRE. The GRE mock tests or we can say GRE simulation exams are a crucial part of the GRE Prep. Taking up the mock test will give an idea of the score you will achieve and it will highlight your weakness so that you can develop a strong study plan. The Economist GRE Tutor’s plan comes with a set of mock tests that are similar to the official GRE test. Their professional team makes sure that the practice tests are the closest experience you get for the real GRE exam. Not only this, their score also tries to give you the best estimates of the GRE score breakdown. At the end of the mock test, you will receive a complete assessment of you strong and weaker areas. Also, they will tell you which types of questions took you the longest to answer and in which areas you need to improve. Anyone who signs up with them for their 7-day free trial will get a free GRE practice test. And if you upgrade to their full plan, you will have a choice of plans that offer between three and five practice exams. WizIQ has over 100+ GRE practice tests for the students to see their performance in various sections of the GRE exam. Their mini practice tests are based on different categories of the GRE exam and are as per the revised edition of the GRE. More than 120 free mock tests on verbal reasoning and quantitative reasoning will help the test taker get an estimate of his or her performance and he or she will be able to know the weaker and stronger section of his or her GRE preparation. You can take up these tests anywhere and anytime as per your convenience. But try not to take a practice test a day before the actual exam. 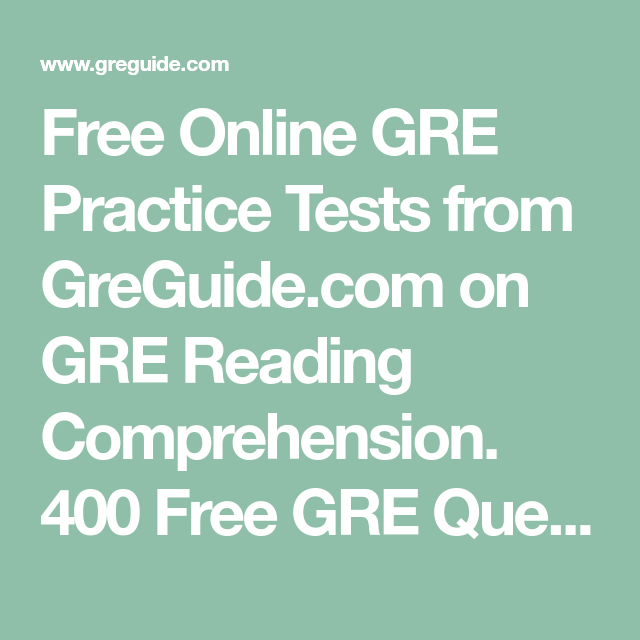 The Greguide.com has 20 free full-length practice tests for the students preparing for the GRE exam. These tests are really beneficial for the students in order to get an idea of the level of preparation they are doing for the exam. Through these mock tests they will come to know how much they have retained in mind and how much they have forgotten. You can segregate your weaker and strong areas based on your test performance and plan up a study plan accordingly. They offer practice tests for every section of the test. In the quantitative and verbal sections there are different kinds of questions and the greguide.com offers 5 free practice tests for each type of question. This will help the students to get familiar with the ongoing pattern of the GRE exam. They allow the test takers to review their answer which helps them to analyze the mistakes they commit when solving a problem. Through this, they can avoid those mistakes on the actual GRE exam. The experience professors have designed 3 full-length practice tests as per the up to date GRE content. The practice test offered by them replicates the real life experience of the actual GRE. It also follows the same format and scoring system as used in the official GRE exam. Once you are finished with the exam, you will be given a personalized score report which will highlight your strengths and weaknesses. Not only this, it comes with tools to see the trouble regions such as the amount of time spent per question, topics that require further review, the easiest way to solve a particular question and more. They also give you detailed explanations to each and every question wherein you can determine not only the reasons for getting a question wrong but also understand the best methodology for solving the question. Taking up the free mock tests are a crucial part of the preparation for an exam. They help get one with your strengths and weaknesses. This, in turn, will help you determine a study plan for your exam. Based on your preparation and the time left for the actual GRE exam, you can take the above-mentioned practice tests and analyze your preparation so far. Also, the reports given at the end of these tests will help you know what is going wrong in your preparation. The scores of the practice test play a crucial role in boosting your confidence on the actual test day. So go ahead and test your preparation.